Construct Wu’s huge ninja training base, Destiny’s Bounty. 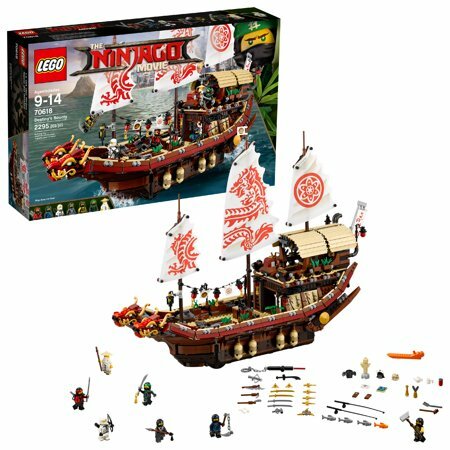 This highly detailed THE LEGO&reg; NINJAGO&reg; MOVIE™ model consists of 3 modular levels and features a double-headed dragon figurehead, decorated sails, wind-up-and-release anchors, dojo area for ninja training, a bathroom and Wu’s bedroom in the hull. This amazing model also includes hidden weapons including the ultimate weapon— the laser-style pointer, plus 7 minifigures with assorted weapons to bolster the exciting role-play possibilities. I received this set as a Christmas gift and have just finished it over the weekend. I don't really know what to say other than... WOW! This set is absolutely AMAZING! I've been building Lego for only a year but I love the creativity of these sets. There are so many little things that were delightful discoveries as I went along, like the bathroom with the little gold sink taps & toilet flush button. The bed is also an amazing piece! It might sound crazy to get all excited over a bed and bathroom but the detail just blows me away! I kind of hate to say it but, as much as I adore my Lego Creator Parisian Restaurant modular which has a similar piece count, this set was even more of a delight to build. The Parisian Restaurant was a bit more linear and straightforward as it's a building. However, the curves, flourishes, and little details on the Ninjago Movie Destiny's Bounty were a challenge which I greatly enjoyed. To put things in prospective a bit, I am visually impaired to the point that I cannot read print unless it's enlarged. Even then it's an inefficient, tedious process. However, the picture instructions Lego uses are fantastic and I always end up figuring them out in the end even if I have to take a break and come back later. I thank Lego for putting all their instructions online so I can download them to my iPad and view them as close up and zoom in and out as I need. With my eyesight, this set took me likely 20 or more hours to build, not counting breaks. I know I spent at least two full days from waking to sleeping on this. To put it in prospective, I worked on this set last Friday from about 9:00 AM to 10:00 PM with few breaks and that only got me through bags 8-12. Other sessions were in three or four hour blocks some afternoons and evenings between starting a new semester and getting into the routine of psychology and applied ethics coursework. I started the ship on January 1st or so and just finished it Saturday. I'll say again, in the most emphatic way I can, IT WAS WORTH IT! Some people might have problems with the fact a bunch of plastic could cost so much money. However, I do not belong to that camp. This is something that can bring immeasurable enjoyment to kids and adults alike. Lego sets can be made in so many different ways. It's better than spending $200 on some fancy toy for your kid that never changes and that goes out of style/becomes obsolete by next season. I see Lego bricks as timeless and clasic in a way that's only achieved by a handful of toys. YOu can spend $160 eating out an expensive restaurant, a hotel room for a weekend getaway, or a day at the amusement park for a family if you're lucky. You can't even keep those outside of your memories and souvenirs you shell out more money for. Lego provides memories and is a tangible thing that lasts. That in mind this, and all other, lego sets I have purchased or received as gifts are ALWAYS worth the money. Thank you, Lego, for doing such great work and creating something beautiful that can so positively effect the lives of people of all ages. Sincerely, TS Note: I've attached a couple pictures of the completed product. My apologies if the angles are a bit funky as I took them myself. Totally worth the money spent for over 2000 pieces. The whole Ninjago movie team's there with their weapons and THE weapon. Tons of interior decorating. Loved the bed and it even has a toilet. My only gripe? The sails don't rotate. I did minor adjustments and it's now perfect. Just see the picture attached for the modification I made. This was the first time my wife and I built a bigger lego set. It was a great experience and it was awesome to see all the pieces come together and all the detail that went into it. It looks amazing! Alot of fun to build. This set has more detail internally and externally than any I've encountered! Even more than displayed on the new Mellinium Falcon with a much more favorable per brick price! It provides a stunning display! Get one while they're still available! The first time I saw Temple of Airjitzu in store, I thought that's amazing creation. However, I was not really sure until I saw Destiny's Bounty . I knew I would have a big ninja family at home. Destiny's Bounty was brilliant. Either the interior or the exterior has a lot of details. During the processing, I had a lot of fun as I was dreaming about the ninja world. After that I also bought Ninjago City set and Temple of Airjitzu. It has been nearly a year. I just posted my comment now because I thought that's good to have this Destiny's Bounty at home. It's worth it! I just built another one for my mom's birthday. I bought this set for my sons 5th birthday present. He saw this in the Lego store last year and loved it. He was amazed by the size of it and characters included. He loves Ninjago and Lego Batman sets after watching the movies. After opening the box and seeing 15 bags plus the two additional parts bags I knew this would take us some time and a few sittings to build, seven hours later on a cold rainy Sunday it was complete! I was pleased with the quality and attention to detail during the build and my son enjoyed every stage. I can't recommend this enough, I managed to buy this before Christmas in the Lego sale, but even at full price this set is definitely worth the price tag. I can see hours of fun ahead for my son and I'm sure as he gets older he will be buying more Ninjago Lego.